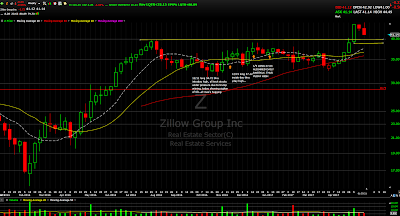 Zillow Group ($Z) and Impinj ($PI) are two stocks that many consider growth names. What’s interesting about both stocks is that the reaction to their earnings results catapulted both stocks from long bases. 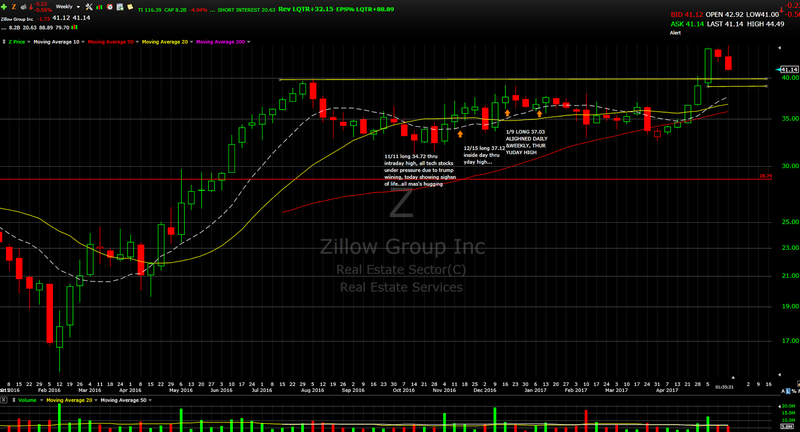 The weekly earnings low on both stocks give you a clear stop loss if you were to get involved in the names. I’m always intrigued by long bases, typically a prolonged period of contraction leads to a prolonged period of expansion, hence the term; the bigger the base, the higher into space it goes. Revenue increased 32% to $245.8 million from $186.0 million in the first quarter of 2016. • Marketplace Revenue increased 36% to $230.3 million from $169.0 million in the first quarter of 2016. • Premier Agent Revenue increased 30% to $175.3 million from $134.5 million in the first quarter of 2016. • Other Real Estate Revenue1 increased 93% to $34.8 million from $18.0 million in the first quarter of 2016. • Mortgages Revenue increased 23% to $20.3 million from $16.5 million in the first quarter of 2016. 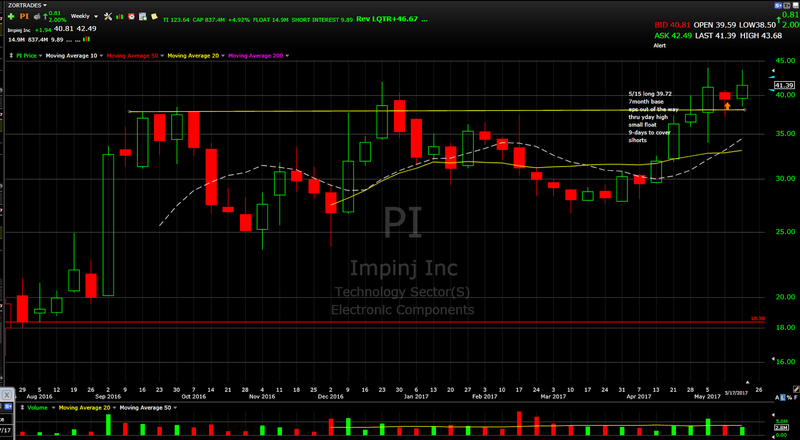 Impinj earned an adjusted 1 cent a share, reversing a year-ago loss of 7 cents a share, in the March quarter. Sales rose 47% to $31.7 million. 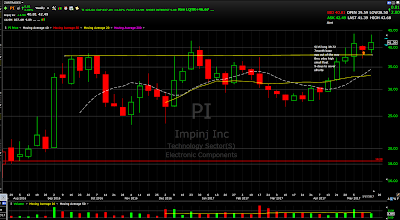 Analysts were expecting Impinj to lose a penny a share on sales of $30.7 million. Impinj RFID chips are used by businesses to track such items as apparel, medical supplies, automobile parts, luggage and food. Applications for its technology include inventory management, patient safety, asset tracking and item authentication.